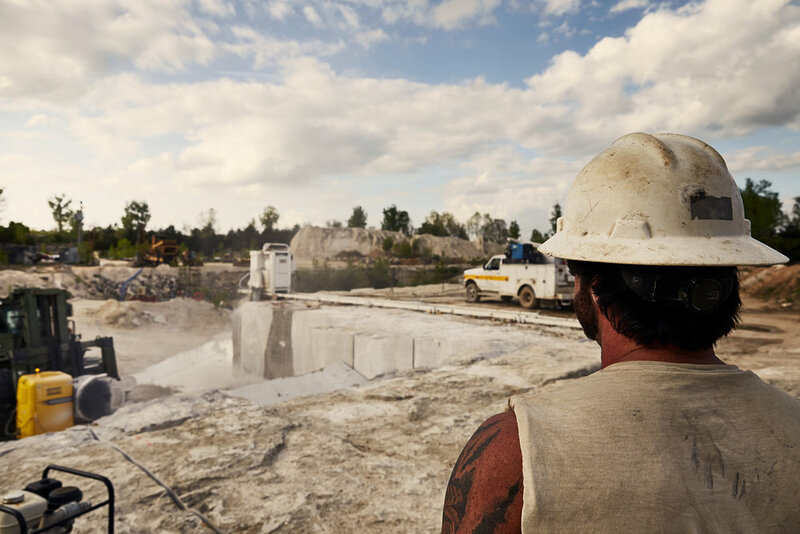 Phenix Marble Company is continuing a legacy that began in 1888 when cut limestone and marble were first quarried here. For the early decades of the 20th century our Napoleon Gray marble was shipped all across the country and used in a wide array of notable buildings. You can learn more about Phenix's origins on our history page and blog. We are thrilled to make this historic stone available once again, and proud to be doing it here in the Ozarks. We're not using the horse and steam-powered machinery that the original quarry workers operated in the early 1900's, but we are mining the same quarry they opened all those years ago. Phenix's natural stone is mined from the original quarry here in Greene County in large blocks. From these blocks it's cut down for a variety of uses - large slabs for polished marble all the way to small split face pieces for veneer. Phenix Marble has its own fabrication center where we can cut, polish, and finish stone to your project's exact specifications. We can also ship stone to your local fabricator for on-site work. Whether your project is a large-scale historic renovation or a simple vanity countertop, we are happy to work with you and furnish the stone you need. Marble slabs are also available for wholesale. Please contact us for further details. Our marble and cut limestone add an elegant distinction to both commercial and residential spaces, interior and exterior. The stone is resilient and requires minimal care. To explore the wide range of products we offer, please refer to the photo galleries under the Marble and Cut Limestone sections. We offer local installation in the Springfield area.